Miss Gallia 2018 Jamie Steger, left, has her photo taken with Miss Gallia 2017 Kaylee Lambert. GALLIPOLIS — Jamie Steger was crowned Miss Gallia County 2018 during the annual Miss Gallia Pageant Monday night among nine ladies vying for the title. Alexis Wothe was named first runner-up, Josie Jones second, Katie Carpenter third and Lexi Taylor fourth. Isabella Moore was named Miss Congeniality. Steger resides in Gallipolis and is the daughter of Jeff and Tracy Steger. She is a senior at Gallia Academy High School. During school, she has been involved in Gallia Academy Varsity Cheer Squad, Varsity Track and Field, Leo Club, Key Club, Gallipolis FFA Livestock, Equine, and Soil judging. In her community, she has taken part in Adopt a Highway with the Gallipois FFA, picking trash from the side of State Route 141. She has also has volunteered at the Gallipolis River Recreational Festival, the Gallipolis Hoop Project, serving dinners at the Veterans of Foreign Wars and has helped maintain the landscaping of the VFW Farm. She has placed brand new flags at the grave sites of veterans, has volunteered at Holzer Senior Care and Arbors Senior Care. She plans to attend Ohio University and will study nursing. Diddle asked Steger to open an envelope with a pageant question designated for her, as all the contestants did. The emcee asked Steger what could Gallia County do to encourage young adults to stay and work in the area. “I think that to encourage young adults to stay in this area is to definitely make it easier and more available to get scholarships for college for them to stay home so they would have job opportunities to stay here,” said Steger. 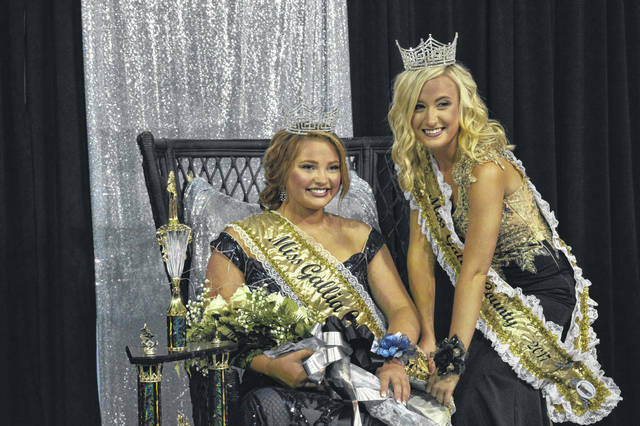 Once named, Steger was crowned by 2017’s Miss Gallia Kaylee Lambert.